PULSE is designed to provide practical leadership skills in an environment where you can learn, not only about yourself, but about what leadership means to you. There are, undeniably, certain sets of words that tend to accompany the concept of leading. Words like ‘ambitious,’ ‘outgoing,’ and phrases such as ‘big personality’ have signaled to many that leadership is not for everyone. Through participation in the program, our hope is for you to realize that leadership is an expression of self and a means of serving, inspiring, and empowering others. Leadership can come from the most unexpected places or the most unlikely of people. We want you to build your own brand of leadership and apply it throughout all areas of your life. You will spend the next two days focusing on the three core values of PULSE – Collaboration, Communication, and Reflection. We believe that these three principals are key to understanding both yourself and your own personal leadership style. 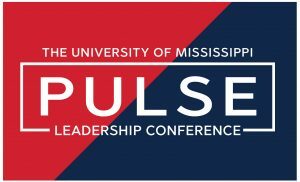 PULSE is a collaborative effort made possible by the leadership of the Office of Leadership & Advocacy and the Ole Miss Women’s Council for Philanthropy. PULSE 2019 will take place January 18-19, 2019. Eligible students (those who have completed 30-59 credit hours) were emailed in November 2018 to apply. For more information, email pulse@olemiss.edu.